From the creators of Symbolon comes a visually beautiful and theologically profound series on the joys and challenges of marriage. This month in Rome, the Augustine Institute released Beloved: The Mystery and Meaning of Marriage. 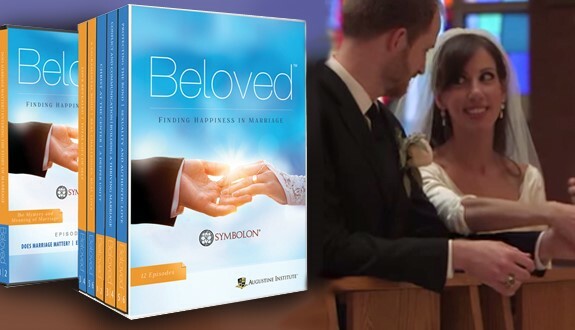 Beloved is the latest edition of Symbolon, a faith-formation series currently being used in almost 4,000 parishes both nationally and internationally. Living in a culture where fewer people are getting married, it is only natural to ask the question, why get married in the first place? Does it really matter? Is it just something on a piece paper? The creators of Beloved understood that we need to appeal to the heart: what kind of love do we want? We long for a lasting love, a love that includes and is made possible only through permanence. Deep down we’re made to love and be loved. Yet, conjugal love—which requires a total gift of self—is experienced and is possible only within the mutual commitment of life-long fidelity, that is, within the context of marriage. We need the security to know that our beloved is not going to leave us, no matter what, in order to reveal who we really are. What is love? Love is engraved on the human heart. We have been made for love. Marriage is more than contract: it is woven into us, into the very design of our humanity. The human love relationship is meant to participate in a bigger love story: God’s love for us. My little love story is meant to be caught up and elevated into this larger Love Story. As people are drawn into each episode of Beloved, it becomes evident that the series’ aim is not simply to transmit knowledge and information about the Church’s teaching on marriage. Rather, the chief aim is evangelization and transformation: to draw us into a deeper encounter with Christ and to have our lives shaped and changed in practical ways through this encounter. This is why Beloved includes interviews with several couples who talk not only about the joys of their marriages but also about the deep difficulties and challenges they have had to face and overcome. An important truth the various couples speak about—one that is perhaps often forgotten or not emphasized enough, even in Catholic circles—is precisely the fact that marriage is a sacrament. And, as a sacrament, marriage offers husbands and wives the specific and actual graces they need to love each other and their children with Christ’s own love. In other words, as a sacrament, marriage is a supernatural reality that allows us to love with a supernatural love—a love that is not accessible to the human person according to our own resources, but only as a grace that flows to us as the fruit of Christ’s death and resurrection. While much attention was given at last year’s Extraordinary Synod on the Family to irregular situations and controversies, little attention was given to the synod’s recognition of the crucial need for developing programs to prepare engaged couples for marriage and to provide ongoing formation to enrich marriages. The Augustine Institute, however, has paid attention to these pressing needs. And Beloved: The Mystery and Meaning of Marriage answers the call to provide such preparation and ongoing formation in a program that is thoroughly rooted in and faithful to the dynamism and spirit of the New Evangelization. Were bishops – and the Vatican – blindsided by the pope’s interview?